That NMG map was inaccurate and misleading when it was put out a decade ago and it’s even worse now. Time has made it worse, because it is less accurate. So, no fault of NMG, but it is worse at accurately portraying the parking situation. Yes, please tell us what was or is inaccurate or misleading about the 2003 downtown parking map. As one of the authors of the diagram, I’d appreciate some constructive insight. Misleading: The map makes no distinction between a parking ramp (like the one across Pearl from Key Center) that is nothing but parking and a large building that has parking beneath it (like Main Place Mall). So, the reader of this map, lacking other information would come away with a very skewed impression of the amount of land area that was devoted to parking, and its impact on Downtown. West side of Washington half the depth of the lots toward Main Street along 1/2+ of the block. Of course with the passage of time other inaccuracies have crept in. Ten years ago, this map was part of an NMG “Park Buffalo” press conference and subsequent Buffalo News piece, intending to show the wide availability of parking in the Central Business District, not to simply show surface parking. This was done in order to help dispel the tired but common perception then (and often today) that “there’s no parking downtown.” If I may say so, the project was somewhat successful in changing the conversation about parking and transportation. Everyone remembers this map. Not too shabby for an all-volunteer effort. Core data was taken from a 2000 City of Buffalo study by Desman Associates and, as I recall, the UB Regional Institute. This was augmented by our own on-the-ground observations, as we knew the map had many small inaccuracies. These errors were corrected where we noticed them—remember that this was before quality online aerial mapping was freely available—and we were well aware that a few errors would slip through. Except for a few glaring items, however, the mistakes were small, and the smaller omissions balanced out the handful of other misidentifications. The picture presented is quite accurate. There was no appreciable skew, and therefore virtually no chance of a “very skewed impression” as you put it. There were others. In addition, a few small lots were misplaced, but otherwise spatially accurate. Correcting the map by adding all of the items above and subtracting the mistaken items (including the ones you listed) would produce an identical impression to any reader. Finally, I agree entirely that the 2003 map doesn’t reflect the realities of 2013. There has been some encouraging infill, some of the most notable examples of which you list, but certainly a long way to go if we want to eliminate a meaningful portion of the red on the 2003 map. Let’s hope this nascent trend accelerates! Point taken. 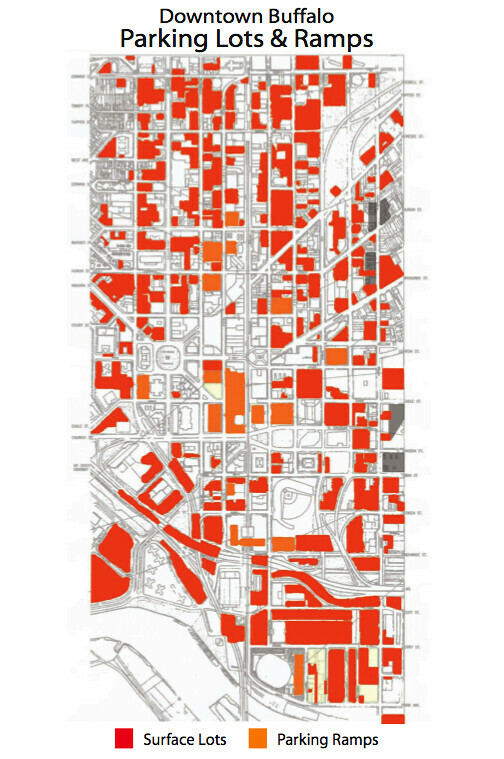 Because the map has been used so routinely to convey some variant of Alan’s “showing that downtown Buffalo is made up mostly of parking” argument I wasn’t aware that its original intent was to show how available parking was. In that context making the Rath Building look like a ramp makes sense, but it certainly opens the map to misuse of the “there’s nothing downtown but parking” sort. It would be great to see a 2013 version of that map that both takes advantage of advances in technology and the changes on the ground. Maybe something that could be crowd sourced via Google Maps or wiki something or other. Even with crosswalks it can get pretty dicey for pedestrians here. People just aren’t used to looking for people when they go wheeling through a right on red, or green arrow that permits crossing across the flow. OTOH, there’s plenty of pedestrians round here who just assume they are seen day or night and dont need to be aware of their surroundings. Looking at you, jogger on Main St. the other day who cut in front of my car without stopping when I had a green light. What do you expect from communities designed based on a car culture? Sidewalks and crosswalks are a formality to be pushed down to the lowest priority. If you can’t afford a car to get around in these areas you should be prepared to take your life into your own hands dealing with crossing these streets and taking public transit. Honestly, I’m surprised there are as many sidewalks as there are on Transit and Maple. Round-a-bouts? What did you expect Alan? Your living in the only remaining country in the world that just can’t seem to figure out the metric system. It’s not WNY Alan. You just notice it more here because you live here. People were very against the idea of roundabouts in the Village of Hamburg and they have proven to be safer and more efficient in the flow of traffic along Main and Buffalo Streets. Of course, this hasn’t stopped people from complaining about them, but oh well.